Our equip professionals are trained in the best schools and teachers the most prestigious within the world of Animal Assisted Therapy. Our methodology incorporates different philosophies and methodologies within Hippotherapy, assisted psychotherapy and coaching horses, Thus making exclusive, unique and customized planning work for each user. We provide training related Assisted Interventions Horses. I fell in Vilobí d'Onyar, 10 Km Girona, 96 Km de Barcelona. i a 8 min de l’Girona Airport. The site is exceptional, both in location and for the environment, which is why we can offer other services such as lodging, rental of facilities for meetings and events and stabling of horses in freedom. 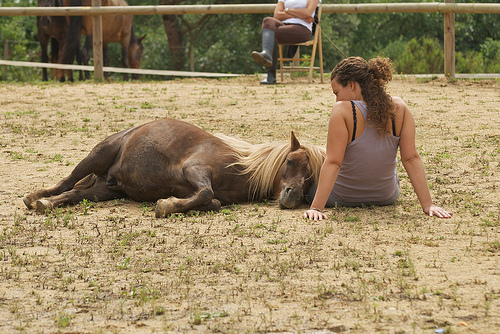 Arrandeterra, Coaching with horses, Was created to d'aportar welfare to people and give them appropriate and sacred space for reflection, learning and personal growth. Philosophy d 'Arrandeterra based on evidence that contact with nature relaxes you, makes us noble feelings emerge relationship with the world and reminds us that we are an integral part. The humans are the only animals able to live the present 100%. Learn from situations experienced in the past to cope more successfully to the circumstances of the moment. No stagnate unreal time such as past and future. Live according solved. We can teach, among other attitudes coping in life, to live in the moment, as they do, because the only way we relate it successfully evading us is our human brain and momentarily putting his skin, trying to think like the animal they are. This wonderful capacity is uniquely human and transferred to our social life can be a great exercise in humility, understanding and acceptance of life. Arrandeterra means firmness, consistency, boldness, I connect with our environment and our presence, serenity, balance and safety. This is represented by a picture of the four legs of the horse, it reflected perfectly. the horsesBy nature are great educators emotional. Because their survival depends on being alert to the subtleties of its surroundings, capture our energy level, even being at a great distance. 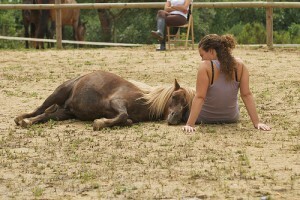 He horse works like a huge receiver and amplifier emotions and intentions. So his feedback before our emotional state is immediate. This gives us a unique opportunity to see what we have emotional behavior and find the tools to change it. Our attitude to events that happen in our life determines the outcome of these events. Properly manage our emotions can have repercussions for our highly successful life. Horses and other animals, if we look at them with eyes of curiosity, can teach us a way to live and coexist with the world very satisfactory. Informative lecture on equine therapy and coaching with horses. Coaching introduction to the world of horses. Workshop on healthy eating for people with hypertension and / or diabetes mellitus.